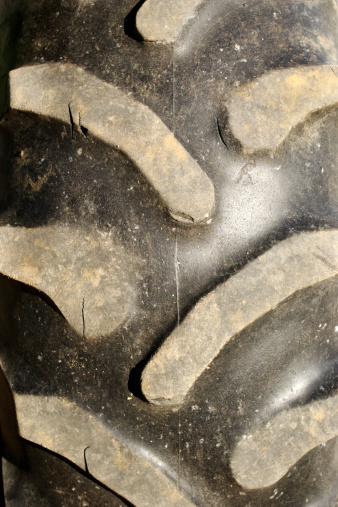 The tires on a tractor take a lot of wear and tear. Driving around your yard or working in your garden can easily result in a punctured tire when you run over a sharp rock, for example. After a long period of time, tractor tires can dry rot as well. To avoid the hassle of having to patch a tire, or even replace it, you can make them resilient to punctures. To do this, you'll need a few tools and a foam product. Push the tractor to a solid, level work area, preferably indoors. Place a jack underneath the frame in the front. Make sure it's centered. Set the tractor brake and place tire chocks behind the rear tires. Jack the front of the tractor up so the tires are just off the ground. Turn the tire so the valve stem is at the top. Use a valve stem puller to remove it. Drill a small hole in the center of the tire tread. The hole should be just large enough to push the end of the spray tube on the expanding rigid foam into it. Make sure you drill all the way through the tractor tire. Read and follow the directions on the expanding rigid foam can. Insert the end of the spray tube into the hole you drilled in the tire. Press the button and slowly fill the tire to flat proof it. When the foam starts coming out of the valve stem, reinstall the valve stem into the tractor tire and put the cap back on. Continue filling the tractor tire with the expanding rigid foam until it comes out the hole you drilled. Remove the spray tube. Leave the tractor tires jacked up for a few days to allow the foam to cure.